David E. Joyce, compiler, e-mail address, Pane-Joyce Genealogy, 12 Dec 2011. Susan E. Roser, Mayflower Increasings, Baltimore, Maryland: Genealogical Pub. 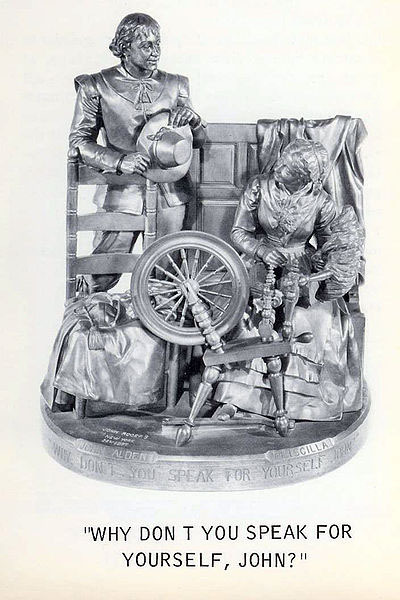 Co., 2nd ed., 1995, Repository: LDS Family History Library - Salt Lake City, Call No. US/CAN 974.482 D2r 1995. Alden Kindred of America Website. Wikipedia contributors, "John Adams," Wikipedia, The Free Encyclopedia, http://en.wikipedia.org/w/index.php?title=John_Adams&oldid=465751869(accessed December 19, 2011). Biography* � John Adams was an American lawyer, statesman, diplomat and political theorist. A leading champion of independence in 1776, he was the second President of the United States (1797–1801). Hailing from New England, Adams, a prominent lawyer and public figure in Boston, was highly educated and represented Enlightenment values promoting republicanism. A Federalist, he was highly influential and one of the key Founding Fathers of the United States. Adams came to prominence in the early stages of the American Revolution. As a delegate from Massachusetts to the Continental Congress, he played a leading role in persuading Congress to declare independence. He assigned Thomas Jefferson the role of drafting the United States Declaration of Independence in 1776, and assisted him in that process. As a representative of Congress in Europe, he was a major negotiator of the eventual peace treaty with Great Britain, and chiefly responsible for obtaining important loans from Amsterdam bankers. A political theorist and historian, Adams largely wrote the Massachusetts state constitution in 1780 which soon after ended slavery in Massachusetts, but was in Europe when the federal Constitution was drafted on similar principles later in the decade. One of his greatest roles was as a judge of character: in 1775, he nominated George Washington to be commander-in-chief, and 25 years later nominated John Marshall to be Chief Justice of the United States. Adams' revolutionary credentials secured him two terms as George Washington's vice president and his own election in 1796 as the second president. During his one term, he encountered ferocious attacks by the Jeffersonian Republicans, as well as the dominant faction in his own Federalist Party led by his bitter enemy Alexander Hamilton. Adams signed the controversial Alien and Sedition Acts, and built up the army and navy especially in the face of an undeclared naval war (called the "Quasi War") with France, 1798–1800. The major accomplishment of his presidency was his peaceful resolution of the conflict in the face of Hamilton's opposition. John Adams, 2nd President of the U.S.
John Quincy Adams, 5th President of the U.S.
James Danforth 'Dan' Quayle, Vice President of the U.S.
Robert Charles Anderson, The Great Migration Begins: Immigrants to New England 1620-1633 (3 vols. ), Boston: New England Historic Genealogical Society, 1995. Wikipedia contributors, "John Alden," Wikipedia, The Free Encyclopedia, http://en.wikipedia.org/w/index.php?title=John_Alden&oldid=462346658 (accessed December 19, 2011). Culpepper Connections publisher, Warren Culpepper, is also a descendant of John and Priscilla Alden through his maternal line. Birth* circa 1599� He was born circa 1599 at England. There are several theories regarding Alden's ancestry. According to William Bradford’s Of Plimoth Plantation, he was hired as a cooper in Southampton, England, just before the voyage to America. In The English Ancestry and Homes of the Pilgrim Fathers, Charles Edward Banks suggested that John was the son of George and Jane Alden and grandson of Richard and Avys Alden of Southampton. However, there are no further occurrences of the names George, Richard, and Avys in his family which would have been unusual in the seventeenth century. Biography* � John Alden is said to be the first person from the Mayflower to set foot on Plymouth Rock in 1620. He was a ship-carpenter by trade and a cooper for Mayflower, which was usually docked at Southampton. He was also one of the founders of Plymouth Colony and the seventh signer of the Mayflower Compact. Distinguished for practical wisdom, integrity and decision, he acquired and retained a commanding influence over his associates. Employed in public business he became the Governor's Assistant, the Duxbury Deputy to the General Court of Plymouth, a member under arms of Capt. Miles Standish's Duxbury Company, a member of Council of War, Treasurer of Plimoth Colony, and Commissioner to Yarmouth. John was the last male survivor of the signers of the Mayflower Compact, and with the exception of Mary Allerton, he was the last survivor of the Mayflower's company. He died at Duxbury on September 12, 1687. Both he and his wife Priscilla Mullins lie buried in the Miles Standish Burial Ground. The Alden residence is also in Duxbury, on the north side of the village, on a farm which is still in possession of their descendants of the seventh generation. He made no will, having distributed the greater part of his estate among his children during his lifetime. John Alden's House, now a National Historic Landmark, was built in 1653 and is open to the public as a museum. It is run by the Alden Kindred of America, an organization which provides historical information about him and his home, including genealogical records of his descendants. Multiple authors, History of the Town of Hingham, Massachusetts (3 vols. ), Hingham, MA: Town of Hingham, 1893, Repository: LDS Family History Library - Salt Lake City, Call No. US/CAN Book 974.482/H1 H2. New England Historic Genealogical Society, compiler, Vital Records of Scituate, Massachusetts to the Year 1850 (2 vols. ), Boston: Stanhope Press, 1909, Repository: LDS Family History Library - Salt Lake City, Call No. 974.482/S1 V28. John Brooks Threlfall, “An extension of the Sheafe ancestry,” New Eng. Hist. Gen. Reg., 137 (1983): 291-305. Samuel Deane, History of Scituate, Massachusetts: from its first settlement to 1831, North Scituate, MA: Bates & Vinal, 1899, Repository: LDS Family History Library - Salt Lake City, Call No. US/CAN Book 974.482/S1 H2. Lloyd Vernon Briggs, History and Genealogy of the Briggs Family, 1254-1937 (3 vols. ), Boston: C. E. Goodspeed & Co, 1938, Repository: LDS Family History Library - Salt Lake City, Call No. 929.273 B768bL. James Savage, A genealogical dictionary of the first settlers of New England: showing three generations of those who came before May 1692, on the basis of Farmer's register, Boston: Little, Brown and Company, 1860-1862, Repository: LDS Family History Library - Salt Lake City, Call No. US/CAN Book 974 D2s 1969. James S. Cushing, The genealogy of the Cushing family: an account of the ancestors and descendants of Matthew Cushing, who came to America in 1638, Montreal: The Perrault Printing Co., 1905, Repository: LDS Family History Library - Salt Lake City, Call No. US/CAN Film 496593 Item 1. “Plymouth Colony vital records,” Mayflower Descendant, Transcribed by George Ernest Bowman, various volumes. “Duxbury, Mass., Vital Records,” Transcribed by George Ernest Bowman, Mayflower Descendant, various volumes. James N. Arnold, Vital Record of Rhode Island 1636-1850, Vol. 4, Little Compton, Providence: Narragansett Historical Publ. Co., 1893. Biography* � “William, who grew up in Duxbury, Mass., is referred to in various documents of the period as a yeoman, boatman, planter, and wheelwright. He was also a land surveyor. On Nov. 1, 1648, four years after he was married, he bought from John Holland and Hopestill Foster of Dorchester, Mass., a dwelling house, garden, stables, land and meadow. He later bought additional tracts of land in Mattapoisett and Sepecan. At one point, on Oct. 27, 1680, he adjusted a boundary line between his lands and those of Mrs. Sarah Parke and William Brewster. He served as a Duxbury town officer and as a representative or deputy to the General Court at Plymouth, being repeatedly elected to the court from 1654 to 1663, then again in 1668, and continuously from 1671 to 1682. He was admitted a freeman of the colony June 5, 1651. Will* 13 May 1707� He made a will at Little Compton, Bristol Co., Rhode Island, on 13 May 1707. "Item I give unto my three Gransons Namely Stephen Southworth the naturall son of my daughter Rebecca now Deceased and the naturall sons of my son William Pabodie Namely John Pabodie & William Pabodie as followeth, whereas there are certain lands belonging unto me the Testator Lyeing in or about a place called Wesbanange westward of the town of Providence in Rhod Iland Jurisdiction in New England not as yet bound out nor Divided namely one whole share I purchased of Philip Taber as may apear by Deeds under the hand & seale of sd Taber bearing date November the 12th 1685. and one other share in sd. Land in the same Country Purchased by my son William ffoabs of Shuball Painter as may appear by Deed under his hand and seal bearing date March the 8th, 1682, but assigned over by the said William ffobes unto my son in law Icabod Wiswell and my self the Testator as may appear by an assignment on the back side said Deed Now I give unto my three Gransons before named viz Stephen Southworth John Pabody and William Pabodie one third part of that whole share of land bought of Phillip Taber the other two third parts haveing formerly sold unto my two sons in law namely Edward Southworth & William ffobes allso I give two third parts of my halfe share of what was said Suball Painters the other third part of said half share I sold unto my said son in law Edward Southworth now I say the one third part of my share I bought that was Suball Painters I give unto my said three Gransons namely Stephen Southworth John Pabodie & William Pabodie by an equal Division to them and their heirs for ever. "Item I give unto my naturall Daughter Mary one shilling & to my naturall Daughter Mercey one shilling and unto my naturall Daughter Martha one shilling and unto my naturall Daughter Priscilla one shilling & unto my Naturall Daughter Ruth one shilling and unto my naturall Daughter Hannah one shilling & to my naturall Daughter Lidia one shilling and to the heires of my naturall Daughter Elizabeth one shilling and unto the heirs of my naturall Daughter Rebeccah one shilling. Administration* 13 Sep 1709� An inventory of William's estate included the following groups of items: 70 acres of land; six acres of out land; a share of land in "a Purchase called Washganaug in Rhoad Island Collony"; a dwelling house and half the barn; one mare and her yearling being a mare; one cow and her young calf; sundry books; two feather beds and the furniture belonging to them; four basins, three platters and three porringers; a tankard, a pint pot, a bowl, a cup and a plate; two old chamber pots, one bed pan, two cups and some old pewter; two iron pots and one iron kettle; an old brass pan, two kettles and two skillets; two trammels, a spit, a pair of tongs and a fire slice; a pair of andirons, an old dripping pan, an old skimmer, two turning pots and a grater; a warming pan and two earthen pots; four trays, three keelers and a cheese fatt; three chests and nine chairs; old tools, an old saddle and bridle; two pairs of pinchers, two hammers, four awls, six fishing hooks and lines; two old plow chains, an iron bar and a pair of old plough shares; a pair of cupples and a half peck; a dozen napkins, two table cloths and a looking glass; a grid iron and an old sword; a pair of marking irons, a small pewter bottle and a cow bell; a churn, a runlett and two glass bottles; powder, shot and flints; two pounds, six shillings in cash; linen and woolen wearing apparel; and a pitch fork, for a total estate valued at 407 pounds, 14 shillings. Justin Winsor, History of the Town of Duxbury, Massachusetts, with genealogical registers, Boston: Crosby & Nichols, 1849, Repository: LDS Family History Library - Salt Lake City, Call No. US/CAN 974.482/D1 H2.